Matthew devised a series of marginal visual symbols to help readers find their way about the text of his chronicles. For example, a bishop's mitre indicates that the text concerns a bishop, and an upside-down mitre indicates the death of a bishop. 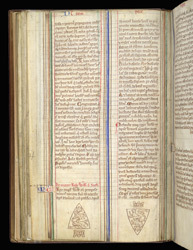 The text on this pages concerns the death of King William II (William Rufus) and the succession of Henry I, in 1100.